Motorola is set to have an event in just a few days on May 13th. Rumor has it the company will announce the Moto E, an even more affordable Android device targeted at developing markets. You don't have to wait for the official unveiling to get a glimpse of the device. 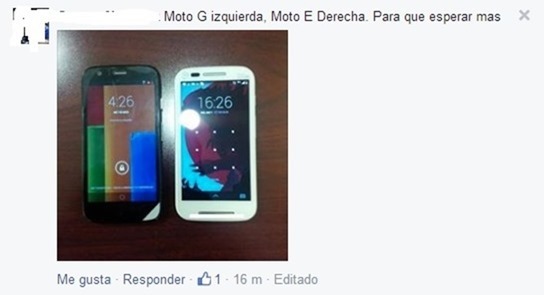 A user apparently posted a pic of the Moto E on Motorola Mexico's Facebook page. 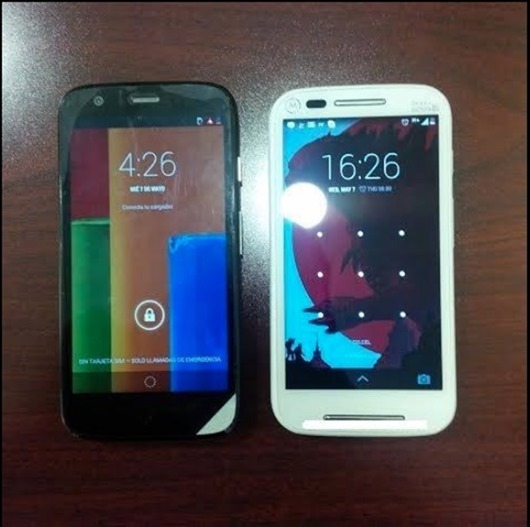 The E (on the right) looks a bit smaller than the Moto G (left), which would fit with the limited information we already have. The device appears to have some branding on the front like older Motorola devices did, but that might be because it's a pre-release testing unit. The user removed this image after posting it, but we've got a screen of the post below (name redacted) as additional confirmation. One odd thing is the apparent lack of a front-facing camera. The oblong spot next to the earpiece is most likely the light sensor – it's the same style as the one on other Moto devices. There's nothing else up there that looks like a camera. Interesting, no?